Complying with JB/T10219 slandard. 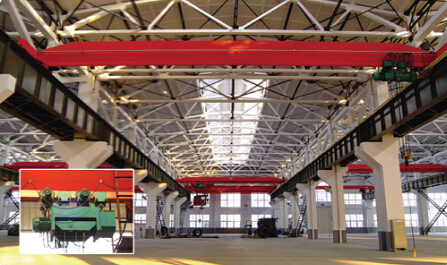 LB explosion-proof crane is allowed to be used in flammable and explosive environments such as chemical workshops，coal mines and oil refineries. Explosion-proof grade is ExdIIBT4. Notice that it is unsuitable to be used in explosive and dust environments. 1.The main girder and end carriage"s frames reler to those of LDA crane. 2.Hoisting mechanism is required to match with an explosion-proof hoist with single-speed or two-speed. 3.Travelling mechanism is required to match with BZDY-type explosion-proof motor and its travelling speed does not exceed 20m/min. 4.Control boxes, safty switches and electrical system must be explosion―proof Power supply of electric hoist and travelling mechanism adopts flexible cables. 5.The manipulation of this crans is ground button control with explosion-proof function.